Alpha 1 antitrypsin (AAT) deficiency (AATD) is a rare genetic risk factor that predisposes an individual to develop early-onset emphysema. While accurate diagnosis of severe AATD is an important goal of clinical care, a minority of individuals with AATD are diagnosed and lack of awareness about the disease is the major suspected cause for this. Since the 1980s, therapy with human plasma-derived AAT has been the only specific treatment for AATD aiming to slow emphysema progression. The first randomised controlled trial to demonstrate this slowing of disease progression with AAT was the Randomized, placebo-controlled trial of augmentation therapy in Alpha1 Proteinase Inhibitor Deficiency (RAPID) study. The RAPID programme, consisting of the initial trial plus its open-label extension (OLE), is the largest completed clinical study of AAT therapy in AATD and the only trial designed specifically to explore the disease-modifying effect of AAT treatment. The RAPID-OLE data substantiate those of the RAPID trial, establishing the sustained efficacy and good tolerability for AAT treatment, providing evidence that AAT treatment modifies the disease course, and supporting the importance of early intervention. Gabriel Thabut has received fees from LFB, France and CSL Behring, France. Luciano Corda has received fees from Grifols, Italy and CSL Behring, Italy. The publication of this article was supported by CSL Behring. The views and opinions expressed in the article are those of the authors and not necessarily those of CSL Behring. Alpha 1 antitrypsin (AAT) deficiency (AATD) is a rare genetic risk factor that predisposes an individual to develop early-onset emphysema. It occurs most commonly in people of European heritage. Accurate diagnosis of severe AATD, including those cases associated with rare genotypes, is an important goal of clinical care as it facilitates early intervention. Despite this, AATD is widely under-recognised. Therapy with human plasma-derived AAT, which increases plasma AAT levels above the threshold considered protective for the lungs with the aim of slowing emphysema progression, is the only specific treatment of patients with AATD. The Randomized, placebo-controlled trial of augmentation therapy in Alpha1 Proteinase Inhibitor Deficiency (RAPID) study was the first randomised, placebo-controlled trial to demonstrate that emphysema progression is slowed by AAT treatment. RAPID, plus its open-label extension (OLE), currently comprises the largest completed clinical study of AAT therapy in patients with AATD and establishes the sustained efficacy and good tolerability of AAT treatment. 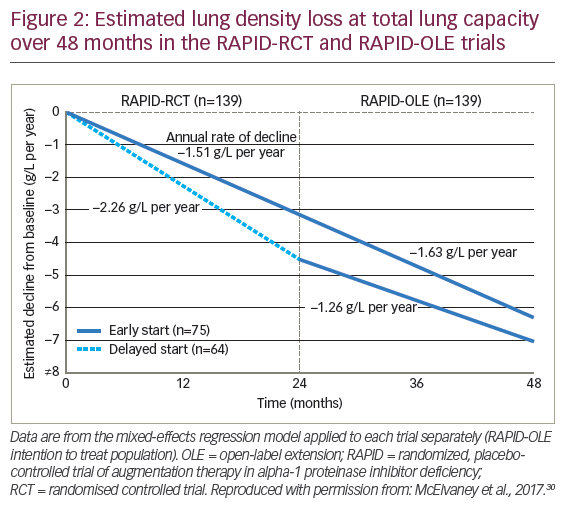 Results from patients in the RAPID-OLE who received delayed AAT treatment following initial randomisation to placebo showed a greater deterioration in lung density than those who initiated AAT therapy earlier; they did not regain the lung tissue lost during the previous 24 months on placebo, indicating that the treatment modifies the course of the disease and supporting the importance of early intervention. Cessation of smoking is recommended in all individuals diagnosed with AATD, and approaches such as inhaler use, pulmonary rehabilitation, lung volume reduction and lung transplantation may be considered in some patients.3,10 However, in patients with emphysema due to severe AATD, infusion of human AAT is currently the only specific treatment for slowing the progression of emphysema associated with this genetic disease. The aim of this article is to describe the prevalence of AATD and the diagnostic strategies in Europe. For the different brands of AAT that are currently available, a brief overview of the product characteristics will be provided, and the clinical evidence available to demonstrate the disease-modifying effects of AAT therapy in AATD-related emphysema will be given. Intravenous (IV) therapy with AAT has been shown to be safe and well tolerated in patients with AATD-associated emphysema. Weekly IV infusions of 60 mg/kg body weight of AAT increase plasma levels beyond the protective threshold of 11 µM (57 mg/dl), protecting lung elastin and alveolar walls from destruction by uninhibited neutrophil elastase.28 Several AAT products are marketed and availability depends on the regulatory status of the respective country (Table 1). This review will focus on the products available in Europe: Respreeza® (CSL Behring, King of Prussia, PA, USA; marketed as Zemaira® in the US), Prolastin® (Grifols Germany GmbH, Frankfurt, Germany), and Alfalastin® (LFB Biomedicaments, Les Ulis, France). Although the starting product in the manufacture of AAT is human plasma in all cases, the production process for each product differs, impacting the product characteristics. During the manufacturing process all products are purified and undergo several virus inactivation steps. A recent study compared the four different AAT products available in Europe at the time of analysis (Respreeza, Prolastin, Alfalastin, and Trypsone® [Grifols, Los Angeles, CA, USA]) in terms of function, purity, structure and chemical modifications.41 Active AAT inhibits neutrophil elastase in a 1:1 fashion but the active protein is easily inactivated e.g., during the production process. As a result, all AAT products contain a mixture of active and inactive AAT as well as other plasma proteins, but their ratios differ. In comparison, Respreeza was found to have the highest level of functionally active AAT protein per volume of infusion-ready product (48.8 mg/mL); Alfalastin having the next highest level at 26.6 mg/mL. As AAT is dosed according to the amount of active protein, the high concentration of active protein per mL leads to a lower total infusion volume and shorter infusion time for Respreeza. Another parameter assessing product quality is the specific activity, which is defined as the ratio of functional protein to total protein. If all protein in the vial were active, the specific activity would be 1. Comparing the four products, Respreeza had the highest specific activity (0.862 mg active AAT per mg total protein, versus 0.775, 0.670 and 0.638 mg for Trypsone, Alfalastin and Prolastin, respectively). The remaining protein is either inactive AAT, which has been altered by the production process, or remaining plasma proteins. Impurities with other plasma proteins such as immunoglobulin A can be a cause of side effects. Compared with the other brands, Respreeza contained the fewest impurities and those were present in low amounts (Figure 3).41 The AATD products tested differ in purity, concentration, and chemical variation. These findings and the possible significance to the patient warrant further investigation. The production process includes a number of highly effective pathogen inactivation steps. For Respreeza these are cold ethanol fractionation, pasteurisation and nanofiltration; their effectiveness has recently been assessed in detail.42 The methods were effective at removing all tested viruses below the limit of detection; in addition, cold ethanol fractionation enabled substantial reduction of prions. These findings confirm that the manufacturing process of Respreeza/Zemaira results in the production of a stable and pure product. The EU approval of Respreeza has expanded the number of countries in Europe in which AAT therapy is currently available (Figure 4). In the EU, Respreeza is indicated for maintenance treatment to slow the progression of emphysema in adults with documented severe AATD (e.g., genotypes Pi*ZZ, Pi*Z[null], Pi*[null,null] and Pi*SZ). Patients are to be under optimal pharmacologic and non-pharmacologic treatment and show evidence of progressive lung disease as evaluated by a healthcare professional experienced in the treatment of AATD.45 Respreeza is the only second-generation AAT inhibitor currently available in the EU although first-generation AAT inhibitors such as Alfalastin and Prolastin are available in some EU countries with a national licence. AATD is substantially underdiagnosed, and is considered one of the most prevalent inherited risk factors among people of European ethnicity.46 The RAPID-OLE study confirms the findings of the RAPID trial, establishing the sustained efficacy for AAT treatment (Respreeza/Zemaira) and suggesting that slower lung density loss rates are achieved irrespective of the time at which treatment commenced.30 Furthermore, RAPID-OLE demonstrated that, between months 24–48, patients from the delayed-start group had similar rates of decline to the early start group and both were comparable with the AAT group during months 0–24. However, the delayed-start group experienced a greater deterioration in lung density than those who initiated AAT therapy earlier and they did not regain the lung tissue lost during the previous 24 months on placebo, highlighting the importance of early intervention.30 The mechanism of action of Respreeza is consistent with its disease-modifying effect: the therapy preserves lung function by preventing degradation of lung parenchymal tissue and alveoli by neutrophil elastase.44 In general, treatment with AAT is well tolerated.36,38 In RAPID-RCT, the incidence of TEAEs occurring with Respreeza was similar to that observed with placebo,38 a finding confirmed by an integrated safety analysis of six clinical trials of 221 patients receiving Respreeza.40 Furthermore, the RAPID trial was the first randomised, placebo-controlled study to show that purified AAT can significantly reduce the progression of emphysema, as assessed by measurement of lung density. Early introduction of treatment in patients with severe emphysema-related AATD may delay the time to death, lung transplantation or respiratory failure.47 Further studies are required to assess long-term outcomes. Stockley RA. Alpha1-antitrypsin deficiency: what has it ever done for us? Chest. 2013;144:1923–9. Gadek JE, Fells GA, Zimmerman RL, et al. Antielastases of the human alveolar structures. Implications for the protease-antiprotease theory of emphysema. J Clin Invest. 1981;68:889–98. American Thoracic Society/European Respiratory Society. Statement: standards for the diagnosis and management of individuals with alpha-1 antitrypsin deficiency. Am J Respir Crit Care Med. 2003;168:818–900. Brantly ML, Wittes JT, Vogelmeier CF, et al. Use of a highly purified alpha 1-antitrypsin standard to establish ranges for the common normal and deficient alpha 1-antitrypsin phenotypes. Chest. 1991;100:703–8. Ferrarotti I, Thun GA, Zorzetto M, et al. Serum levels and genotype distribution of alpha1-antitrypsin in the general population. Thorax. 2012;67:669–74. Badawy MS, El Qarn AF, Mohamadeen HA. Clinical features of alpha1 antitrypsin deﬁciency in COPD. Egypt J Chest Dis Tuberc. 2013;62:71–7. Al Ashry HS, Strange C. COPD in individuals with the PiMZ alpha-1 antitrypsin genotype. Eur Respir Rev. 2017;26: pii: 170068. Blanco I, Bueno P, Diego I, et al. Alpha-1 antitrypsin Pi*SZ genotype: estimated prevalence and number of SZ subjects worldwide. Int J Chron Obstruct Pulmon Dis. 2017;12:1683–94. Greene CM, Marciniak SJ, Teckman J, et al. α1-Antitrypsin deficiency. Nat Rev Dis Primers. 2016;2:16051. Miravitlles M, Dirksen A, Ferrarotti I, et al. European Respiratory Society statement: diagnosis and treatment of pulmonary disease in alpha1-antitrypsin deficiency. Eur Respir J. 2017;50: pii: 1700610.
de Serres FJ, Blanco I. Prevalence of alpha1-antitrypsin deficiency alleles PI*S and PI*Z worldwide and effective screening for each of the five phenotypic classes PI*MS, PI*MZ, PI*SS, PI*SZ, and PI*ZZ: a comprehensive review. Ther Adv Respir Dis. 2012;6:277–95. Luisetti M, Seersholm N. Alpha1-antitrypsin deficiency. 1: epidemiology of alpha1-antitrypsin deficiency. Thorax. 2004;59:164–9. Blanco I, de Serres FJ, Fernandez-Bustillo E, et al. Estimated numbers and prevalence of PI*S and PI*Z alleles of alpha1-antitrypsin deficiency in European countries. Eur Respir J. 2006;27:77–84. Orphanet Report Series. Prevalence and incidence of rare diseases: bibilographic data. Diseases listed by decreasing prevalence, incidence or number of published cases. June 2018; Number 2. Available at: www.orpha.net/orphacom/cahiers/docs/GB/Prevalence_of_rare_diseases_by_decreasing_prevalence_or_cases.pdf (accessed 23 August 2018). McElvaney NG. Diagnosing alpha1-antitrypsin deficiency: how to improve the current algorithm. Eur Respir Rev. 2015;24:52–7. Belmonte I, Barrecheguren M, Lopez-Martinez RM, et al. Application of a diagnostic algorithm for the rare deficient variant Mmalton of alpha-1-antitrypsin deficiency: a new approach. Int J Chron Obstruct Pulmon Dis. 2016;11:2535–41. Kueppers F, Sanders C. State-of-the-art testing for alpha-1 antitrypsin deficiency. Allergy Asthma Proc. 2017;38:108–14. Alpha 1-antitrypsin deficiency: memorandum from a WHO meeting. Bull World Health Organ. 1997;75:397–415. Sandhaus RA, Turino G, Brantly ML, et al. The diagnosis and management of alpha-1 antitrypsin deficiency in the adult. Chronic Obstr Pulm Dis. 2016;3:668–82. Chorostowska-Wynimko J. Targeted screening programmes in COPD: how to identify individuals with alpha1-antitrypsin deficiency. Eur Respir Rev. 2015;24:40–5. Silverman EK, Sandhaus RA. Clinical practice. Alpha1-antitrypsin deficiency. N Engl J Med. 2009;360:2749–57. Campos MA, Wanner A, Zhang G, et al. Trends in the diagnosis of symptomatic patients with alpha1-antitrypsin deficiency between 1968 and 2003. Chest. 2005;128:1179–86. Greulich T, Ottaviani S, Bals R, et al. 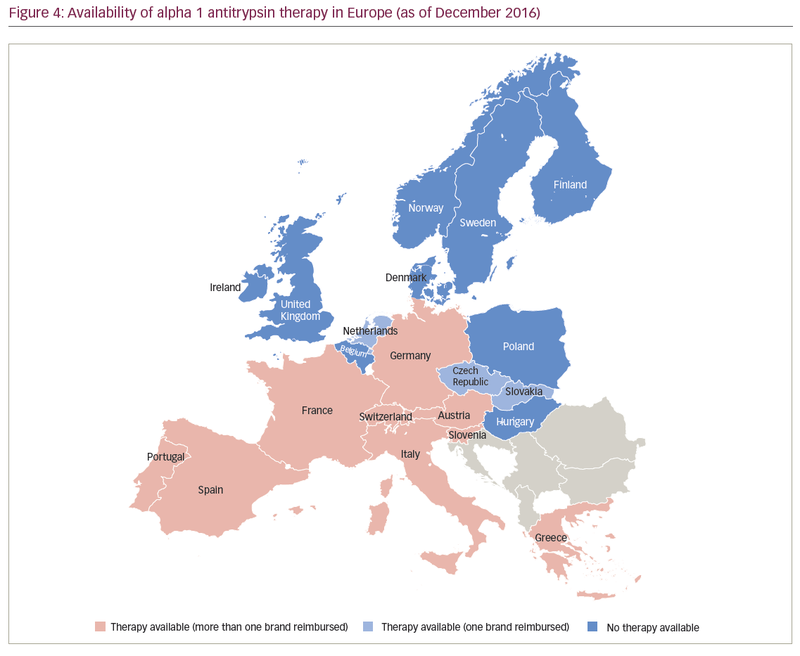 Alpha1-antitrypsin deficiency - diagnostic testing and disease awareness in Germany and Italy. Respir Med. 2013;107:1400–8. Kohnlein T, Janciauskiene S, Welte T. Diagnostic delay and clinical modifiers in alpha-1 antitrypsin deficiency. Ther Adv Respir Dis. 2010;4:279–87. Stoller JK, Sandhaus RA, Turino G, et al. Delay in diagnosis of alpha1-antitrypsin deficiency: a continuing problem. Chest. 2005;128:1989–94. Stoller JK, Fromer L, Brantly M, et al. Primary care diagnosis of alpha-1 antitrypsin deficiency: issues and opportunities. Cleve Clin J Med. 2007;74:869–74. Seersholm N, Kok-Jensen A. 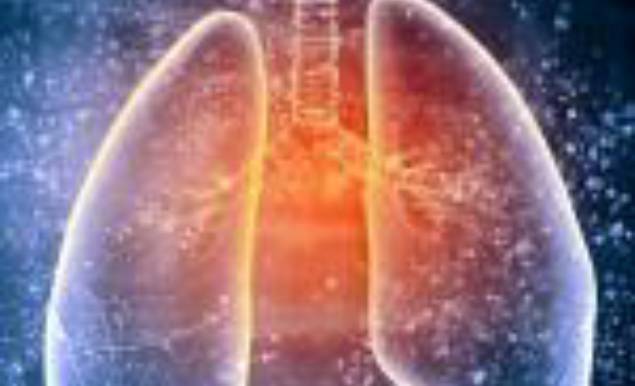 Clinical features and prognosis of life time non-smokers with severe alpha 1-antitrypsin deficiency. Thorax. 1998;53:265–8. Chotirmall SH, Al-Alawi M, McEnery T, et al. Alpha-1 proteinase inhibitors for the treatment of alpha-1 antitrypsin deficiency: safety, tolerability, and patient outcomes. Ther Clin Risk Manag. 2015;11:143–51. Stockley RA, Miravitlles M, Vogelmeier C, et al. Augmentation therapy for alpha-1 antitrypsin deficiency: towards a personalised approach. Orphanet J Rare Dis. 2013;8:149. McElvaney NG, Burdon J, Holmes M, et al. Long-term efficacy and safety of alpha1 proteinase inhibitor treatment for emphysema caused by severe alpha1 antitrypsin deficiency: an open-label extension trial (RAPID-OLE). Lancet Respir Med. 2017;5:51–60. Gildea TR, Shermock KM, Singer ME, et al. Cost-effectiveness analysis of augmentation therapy for severe alpha1-antitrypsin deficiency. Am J Respir Crit Care Med. 2003;167:1387–92. Sclar DA, Evans MA, Robison LM, et al. 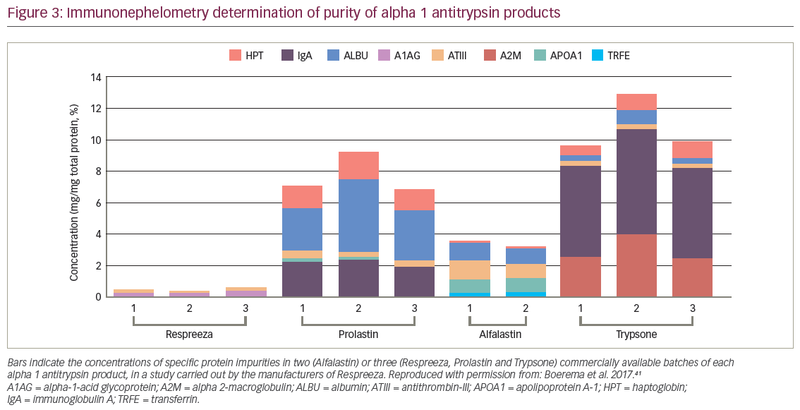 Alpha1-proteinase inhibitor (human) in the treatment of hereditary emphysema secondary to alpha1-antitrypsin deficiency: number and costs of years of life gained. Clin Drug Investig. 2012;32:353–60. Schluchter MD, Stoller JK, Barker AF, et al. Feasibility of a clinical trial of augmentation therapy for alpha(1)-antitrypsin deficiency. The Alpha 1-Antitrypsin Deficiency Registry Study Group. Am J Respir Crit Care Med. 2000;161:796–801. Chapman KR, Stockley RA, Dawkins C, et al. Augmentation therapy for alpha1 antitrypsin deficiency: a meta-analysis. COPD. 2009;6:177–84. Dirksen A, Dijkman JH, Madsen F, et al. A randomized clinical trial of alpha(1)-antitrypsin augmentation therapy. Am J Respir Crit Care Med. 1999;160:1468–72. Dirksen A, Piitulainen E, Parr DG, et al. Exploring the role of CT densitometry: a randomised study of augmentation therapy in alpha1-antitrypsin deficiency. Eur Respir J. 2009;33:1345–53. Stockley RA, Parr DG, Piitulainen E, et al. Therapeutic efficacy of alpha-1 antitrypsin augmentation therapy on the loss of lung tissue: an integrated analysis of 2 randomised clinical trials using computed tomography densitometry. Respir Res. 2010;11:136. Chapman KR, Burdon JG, Piitulainen E, et al. Intravenous augmentation treatment and lung density in severe alpha1 antitrypsin deficiency (RAPID): a randomised, double-blind, placebo-controlled trial. Lancet. 2015;386:360–8. Parr DG, Stoel BC, Stolk J, et al. Validation of computed tomographic lung densitometry for monitoring emphysema in alpha1-antitrypsin deficiency. Thorax. 2006;61:485–90. Sandhaus R, Chapman KR, Burdon J, et al. Integrated safety across six clinical trials of alpha-1 augmentation therapy. Eur Respir J. 2014;44:950. Boerema DJ, An B, Gandhi RP, et al. Biochemical comparison of four commercially available human alpha1-proteinase inhibitors for treatment of alpha1-antitrypsin deficiency. Biologicals. 2017;50:63–72. Kee S, Weber D, Popp B, et al. Pathogen safety and characterisation of a highly purified human alpha1-proteinase inhibitor preparation. Biologicals. 2017;47:25–32. Halpin DM, Tashkin DP. 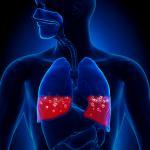 Defining disease modification in chronic obstructive pulmonary disease. COPD. 2009;6:211–25. Chorostowska-Wynimko J. Disease modification in emphysema related to alpha-1 antitrypsin deficiency. COPD. 2016;13:807–15. Respreeza. Summary of product characteristics. Available at: www.medicines.org.uk/emc/product/7026/smpc (accessed 26 August 2018). Greulich T, Nell C, Herr C, et al. Results from a large targeted screening program for alpha-1-antitrypsin deficiency: 2003–2015. Orphanet J Rare Dis. 2016;11:75. Rahaghi FF, Miravitlles M. Long-term clinical outcomes following treatment with alpha 1-proteinase inhibitor for COPD associated with alpha-1 antitrypsin deficiency: a look at the evidence. Respir Res. 2017;18:105.